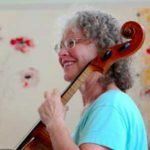 A graduate of the Curtis Institute, Judith was a founding member of the Brattleboro Music School. She has been a member of the Iceland Symphony, the Guilford and the Hebrew Arts (now known as the Mendelssohn) String Quartets, and a participant at the Marlboro Music and Yellow Barn Schools and Festivals. Judith has performed around the world, and has served on the faculty of American University in Washington, DC.